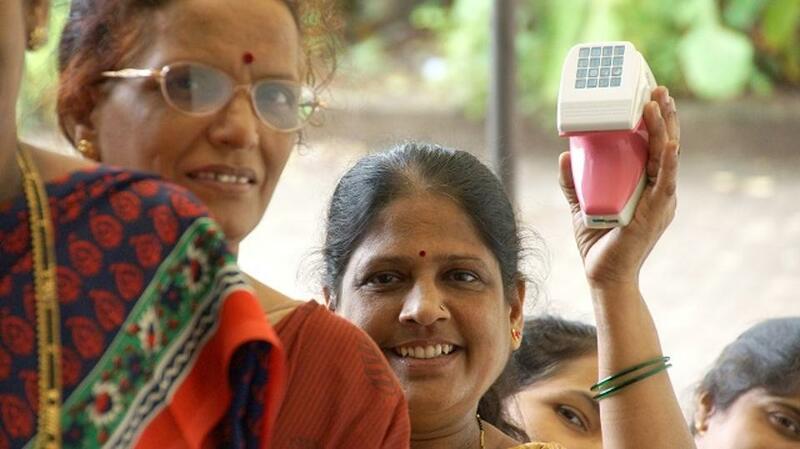 UE LifeSciences’ affordable, high-tech iBreastExam device is effectively tackling breast cancer by making early-detection a reality, across urban and rural India. In 2013, approximately 70,000 Indian women died due to breast cancer; a 43 percent jump from 2008. Today, one in every two diagnosed women are dying of breast cancer. The mortality rate is alarmingly high due to two major reasons – delay in early diagnosis and lack of preventive breast health checks. Mihir Shah (38), a Computer Engineer from Drexel University, pivoted his career into the healthcare domain when he learnt that entrepreneurs can license professors’ and scientists’ patented inventions and convert them into real life products and services. Since 2005, he has worked on multiple healthcare innovations, such as assessing cardiac output in a non-invasive manner, measuring traumatic brain injury-led bleeding in the skull, among others. Need for radiologists – India has an abysmal 10,000 radiologists serving more than a billion people as opposed to the US that has 100,000 radiologists serving 400 million people. How do we close this critical healthcare resource gap? Efficacy of mammography limited in younger women – In a traditional mammography, the breasts are pressed between two plates and the X-ray is carried out. However, younger women have tightly-knit or dense breasts limiting the X-ray to penetrate effectively, leading to inaccurate readings. The accuracy among younger women is only 50–60 percent. With a young and growing population in developing countries such as India, China, and Mexico, this is a clinical bottleneck. Cultural mindset – Lack of affordability and deep-rooted cultural inhibitions prevent Indians from practicing preventive healthcare. Mammography tests which are expensive, painful, and radiation-based are thus avoided. Where is the ROI? – Unlike multi-purpose machines such as a CT scan or MRI, a mammogram machine has a dedicated purpose. Hospitals are unlikely to invest in the best mammogram machines as the cultural mindset and high costs don’t yield high profits. Lack of access – No one solution can work across India’s socio-economic pyramid. For that, it needs to be deployable, scalable, and sustainable. And this is how the seeds of UE LifeSciences were sown in 2009 – to develop innovative and yet cost and clinically effective tools to battle the burden of breast cancer in geographies where incidence is on the rise and where western protocols for screening women is unadoptable or unsustainable. Mihir collaborated with Professor Matthew Campisi and the first product they developed was, NoTouch BreastScan, which uses infrared photography to create a thermal map of the breasts and identify cancer hotspots. After two years, NoTouch BreastScan received US FDA clearance and so far, UE LifeSciences has successfully sold 30 units across seven countries. Recently, the Indian Journal of Gynaecologic Oncology (IJGO) published a study, with iBreastExam demonstrating an increase of 19 percent in detections, even picking up non-palpable cancerous breast lesions, as opposed to the physician administered clinical breast exam. In less than a year, iBreastExam has screened 30,540 women in India, of which 30 early detections were confirmed. For the next year, UE LifeSciences has already received financial commitments to screen 4,00,000 women. UE LifeSciences has also been building significant public, private, and non-profit partnerships. The Government of India is playing a significant role in increasing awareness around breast cancer. The Delhi Health Ministry’s Aam Aadmi Mohalla Clinics recently screened 1,000 women and the Maharashtra State Government pledged screenings for 2,50, 000 women. More are underway. On the corporate side, Bank of Baroda became India’s first nationalised bank to pledge screenings for all its women employees – a welcome move that will pave way for many organisations to follow. Other corporates include Kotak Mahindra, Biocon, The Times of India, and JWT to name a few. This article was originally posted on YourStory.